Lexington, Kentucky is known primarily for two things, its horse industry and university basketball team. The former has had a positive effect on the city’s urban fabric in that horse farms surrounding the city have declined to sell off their property to developers, with the result that the city’s urban core is more compact and without that ubiquitous doughnut hole that surrounds the downtowns of so many Midwestern cities. As for the basketball team’s Rupp Arena, adjacent to the convention center, this has been a focal point of downtown development for decades, surrounded by hotels, restaurants and commercial structures. 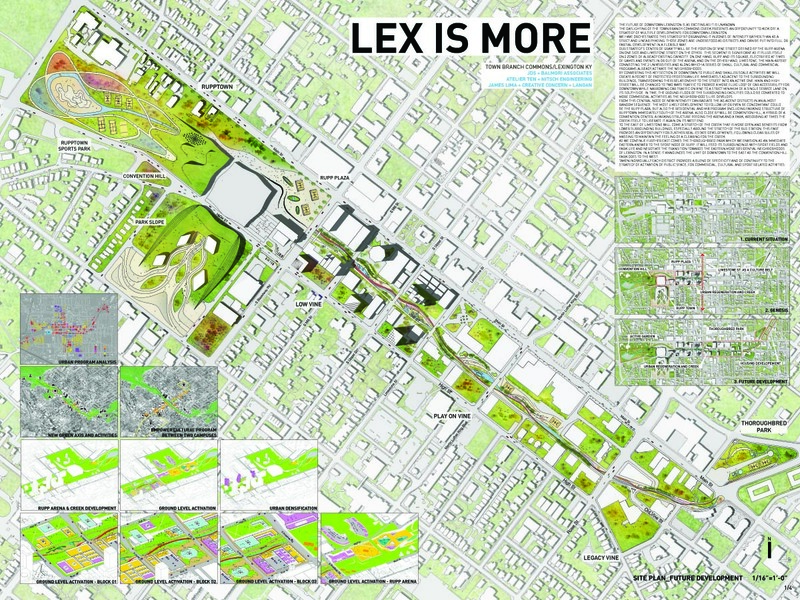 But the city’s center again became the focus of Lexingtonians, when a developer bought up a city block not far from Rupp arena and had it demolished for commercial development. 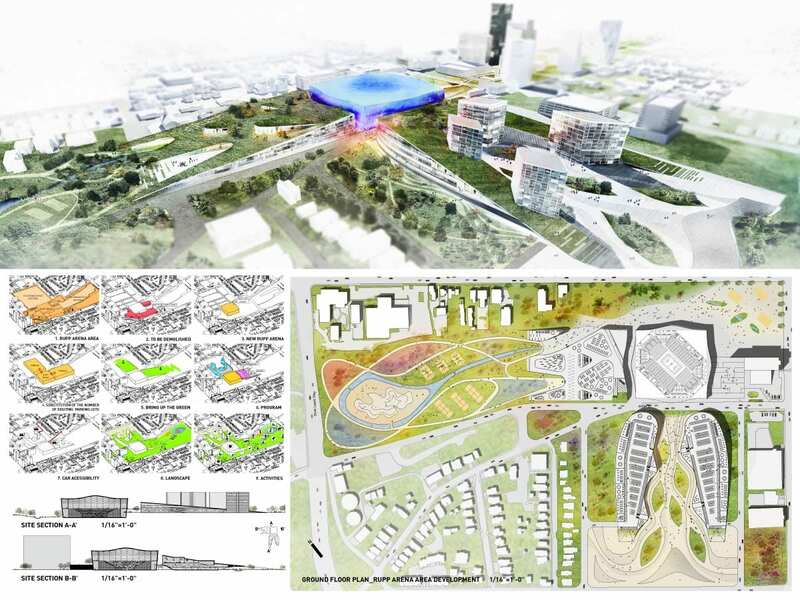 To date, nothing has happened on this site; but with the election of a new mayor, a new initiative to rethink the area around the arena has taken place—and the downtown core as a whole. 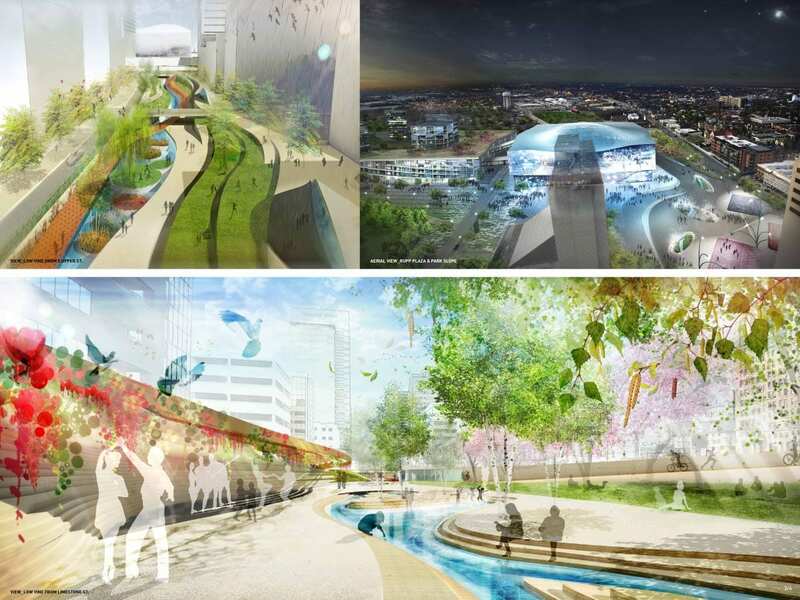 A new task force was created to look at the 62 acres surrounding the arena, much of it underutilized. 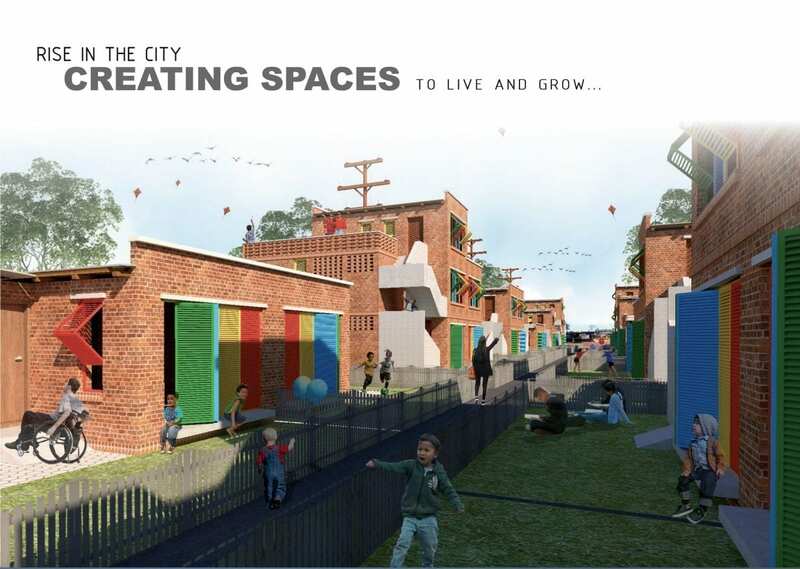 As part of this initiative, Norwegian-based Space Group was engaged to undertake a study and develop a new master plan for the area. 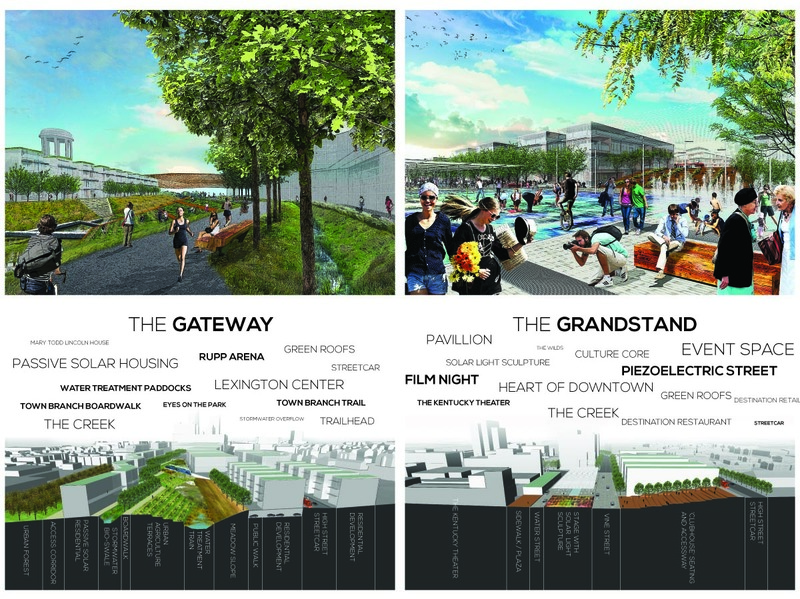 Space Group’s plan was to reconnect the city’s historic center with the adjacent Distillery District, at the same time renovating both the outdated Convention Center and Rupp Arena. On January 31, the five firms discussed projects from their portfolios before a well-attended gathering in the Lexington Children’s Theater. 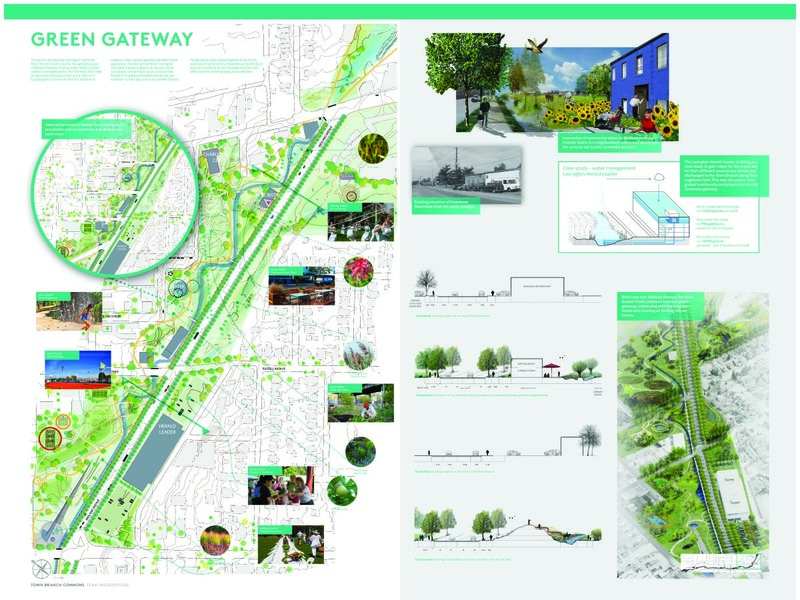 On the following day they presented their final concepts to the competition jury, led by local University of Kentucky Dean, Michael Speaks, and including Landscape Architecture editor, Brad McKee and frequent international juror, Aaron Betsky, Director of the Cincinnati Museum of Art. 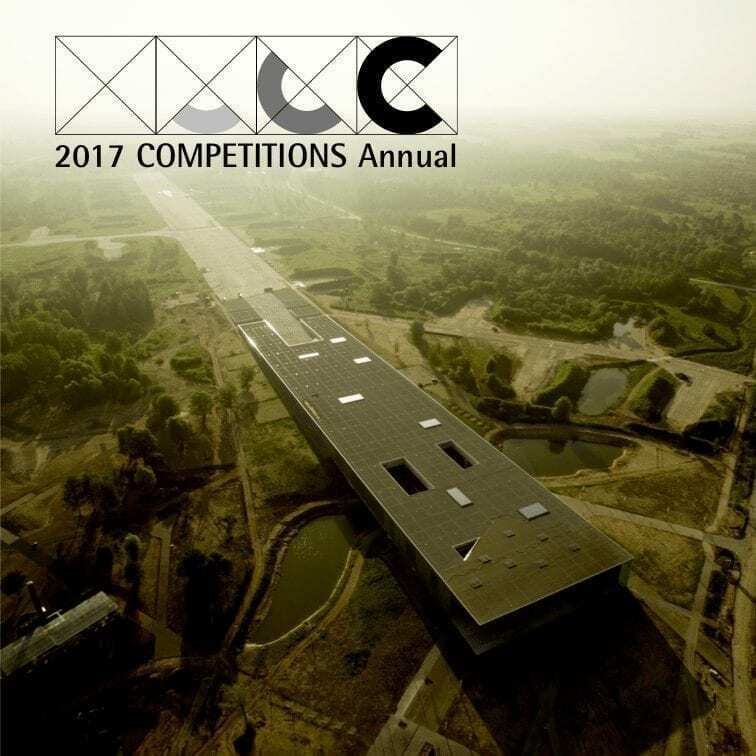 At the conclusion of the presentations, the jury was unanimous in its decision to select SCAPE/Landscape Architecture led by Kate Orff, as the winner. 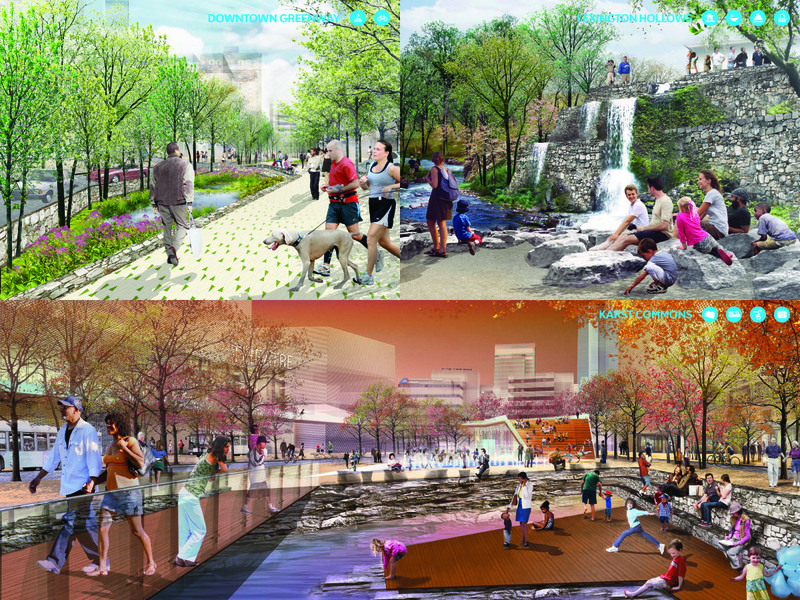 In the meantime, SCAPE / Landscape has received a $200,000 stipend from the City to further refine its concept. Juror Michael Speaks recently was of the opinion that this idea has a good chance of implementation, in no small part because of a progressive city administration led by Mayor Jim Gray. 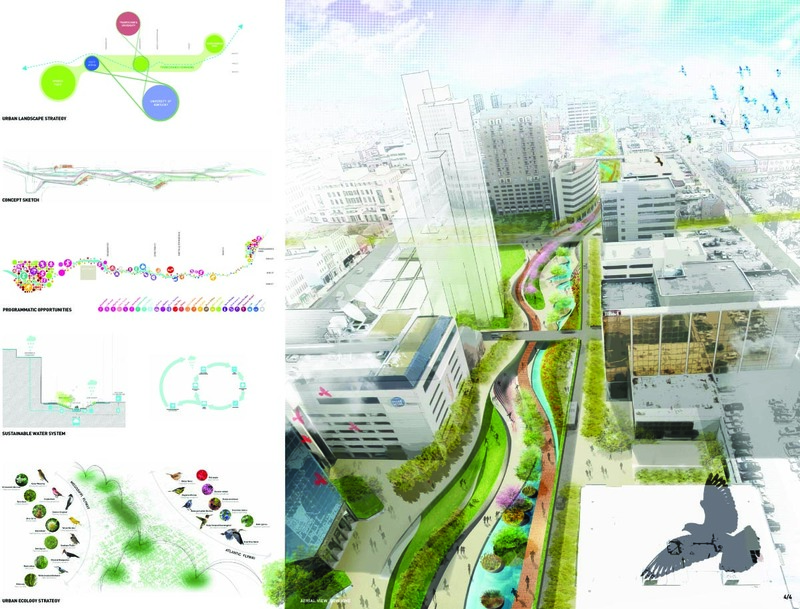 SCAPE/Landscape Architecture’s proposal—a linear park—was all about revealing different visual experiences of the “creek” in four exposed features, three of them at intervals bordering along a narrower Vine Street. Bringing this watershed to the surface meant the conversion of parking into areas of live activity, with water as the prime attraction. 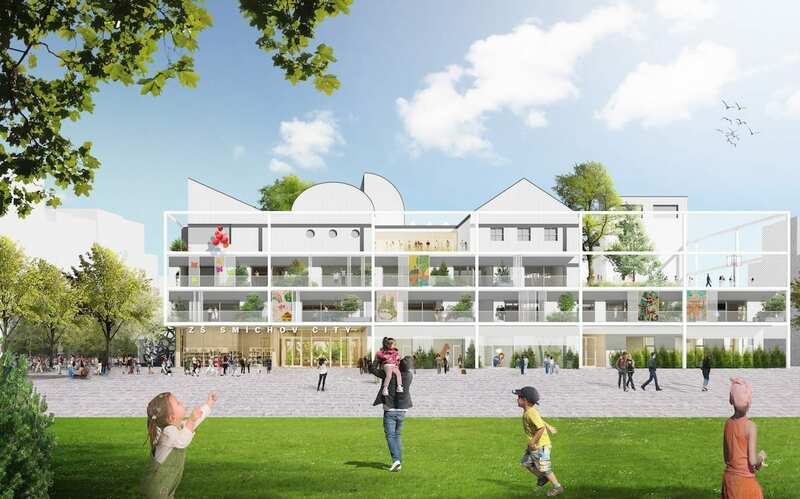 This was not about gimmickry, but the sensitive integration of each zone with its own personality into the urban fabric. It was not only about raising the water to the surface at different intervals, filtration of the creek along the way was also a major concern. 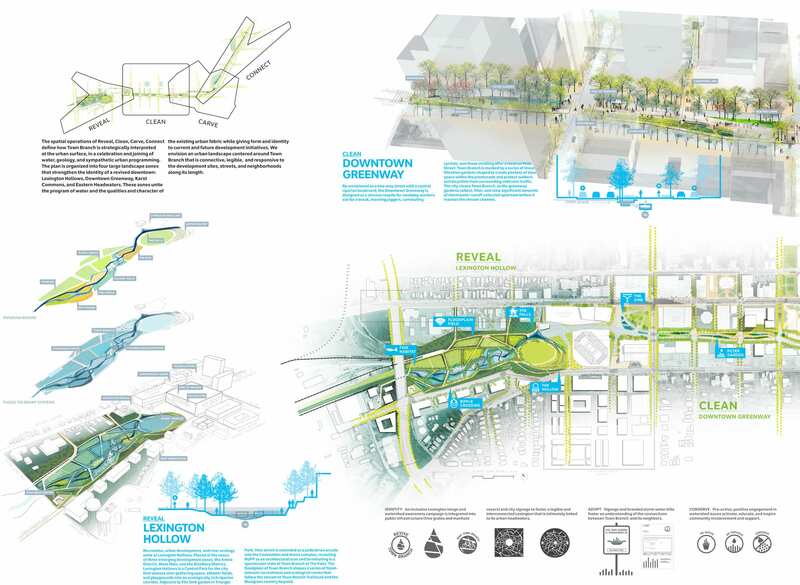 The designers envisioned four separate landscape zones: the Lexington Hollows, Downtown Greenway, Karst Commons, and Eastern Headwaters. 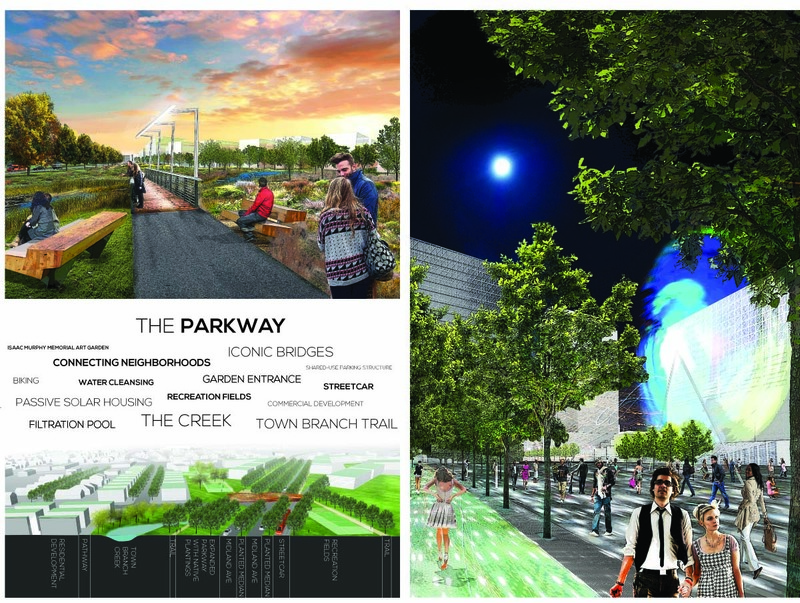 Matching the landscape to an urban condition was a major challenge: and, in the case of Lexington’s growing theater district, a series of nearby plazas are intended as an extended amenity conducive to the area’s nightlife. 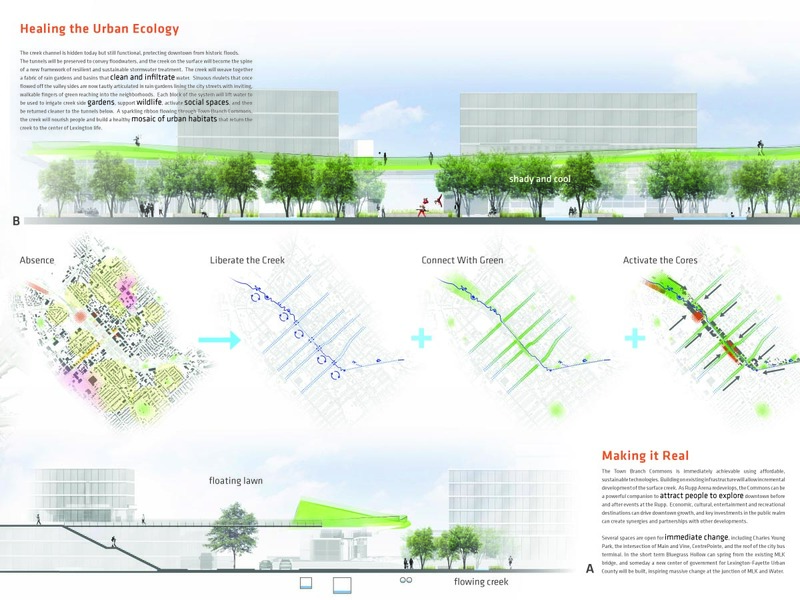 Establishing a better connection from upper Martin Luther King Boulevard from the south to the “Commons” is accomplished by closing off a section of that street and locating a ramp over Vine Street, luring pedestrians either to view the water feature from its steps (a reference to the Spanish Steps?) or join the activities below. 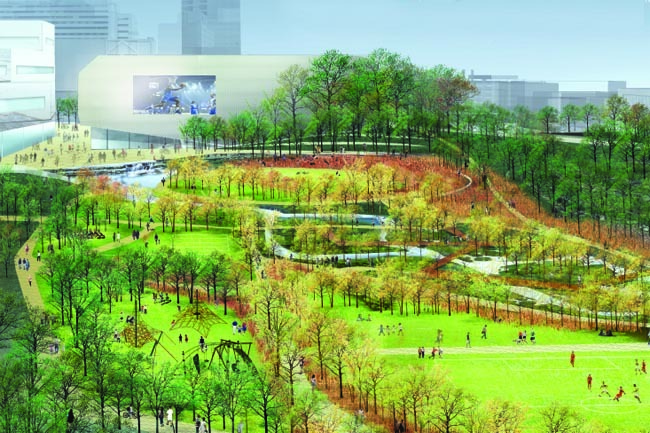 The “Hollow,” which also serves as a flood plain below its exit from the Arena, lends itself to more conventional activities in a landscape setting and certainly marks an immense improvement to the current wasteland location. 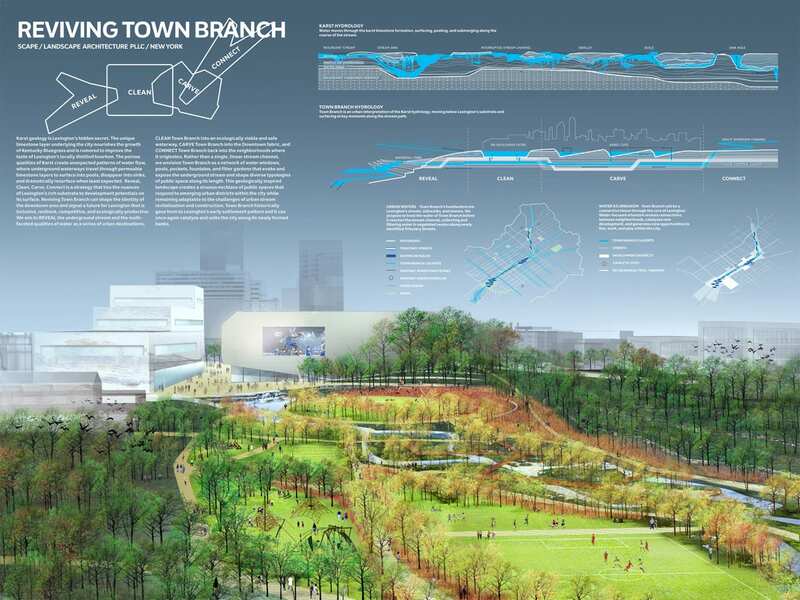 The addition of various trails would provide Lexingtonians with an added exercise venue, an attraction close in to the city’s center and a welcome alternative to walkers and joggers who are frequent visitors to the University Arboretum. 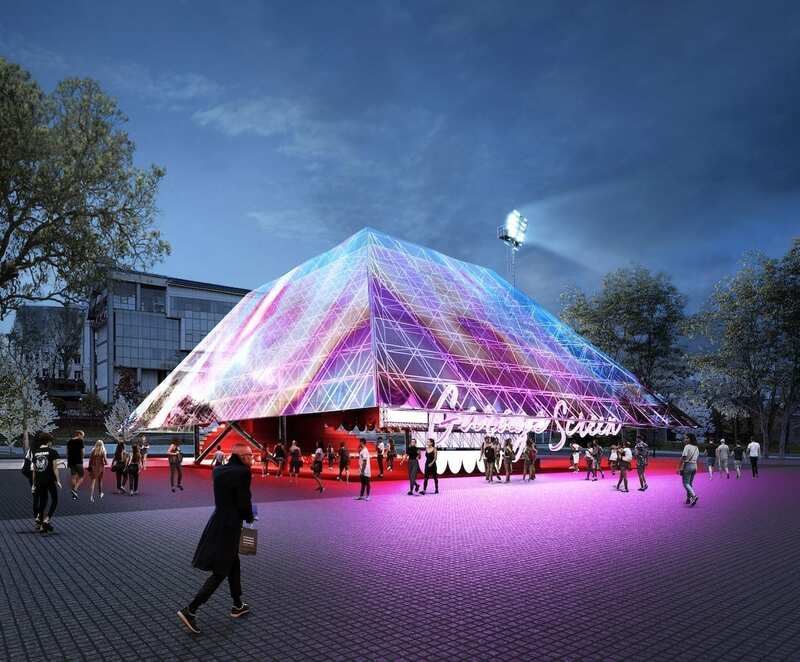 Part of SCAPE / Landscape’s verbal presentation was about project maintenance. Bringing in an expert to explain this issue in some detail was a clever move, for there was no doubt that it made a very positive impression on the listeners and helped to solidify the firm’s case. 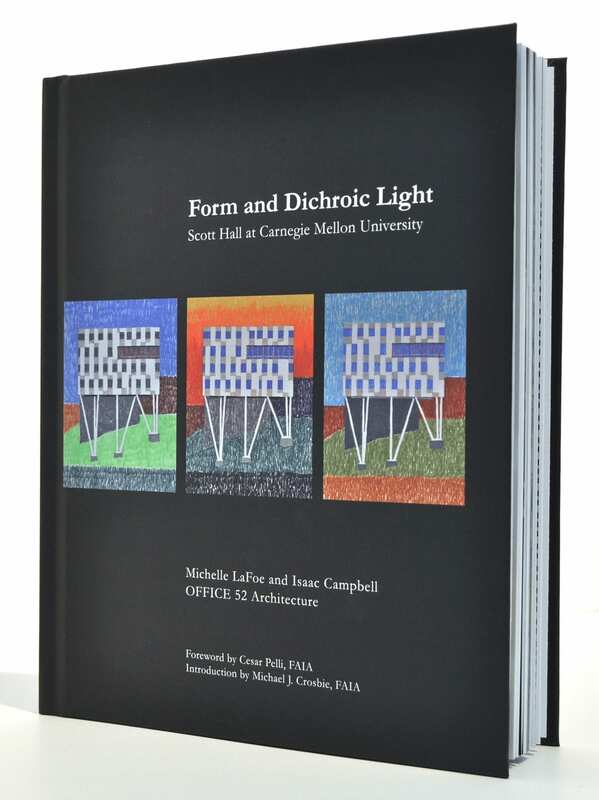 In summary, SCAPE / Landscape’s major contribution lies in its ability to turn the lackluster appearance of a back alley scene along Vine Street into something resembling an unusual arrival feature for varied activities—as well as views to lift the spirits. 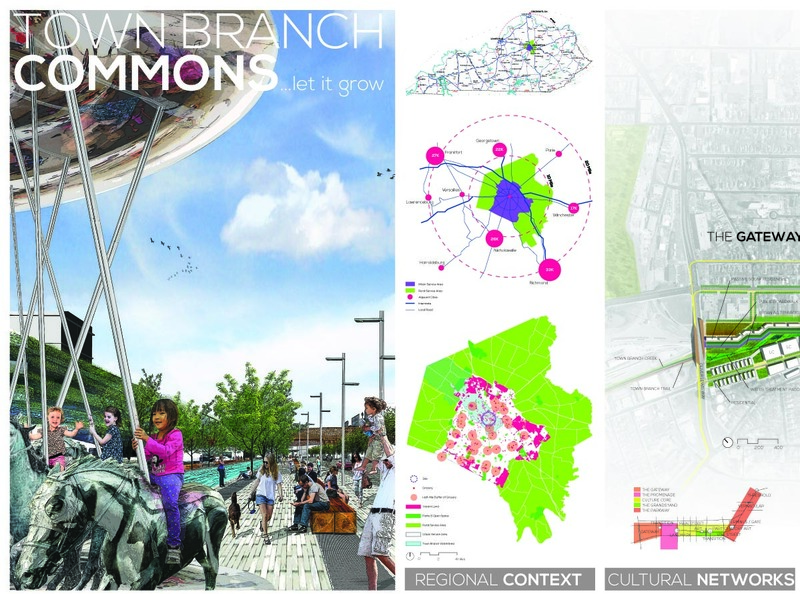 Downtown Lexington is already experiencing a comeback, and a high quality project of this nature can only serve to act as a future catalyst for positive growth. 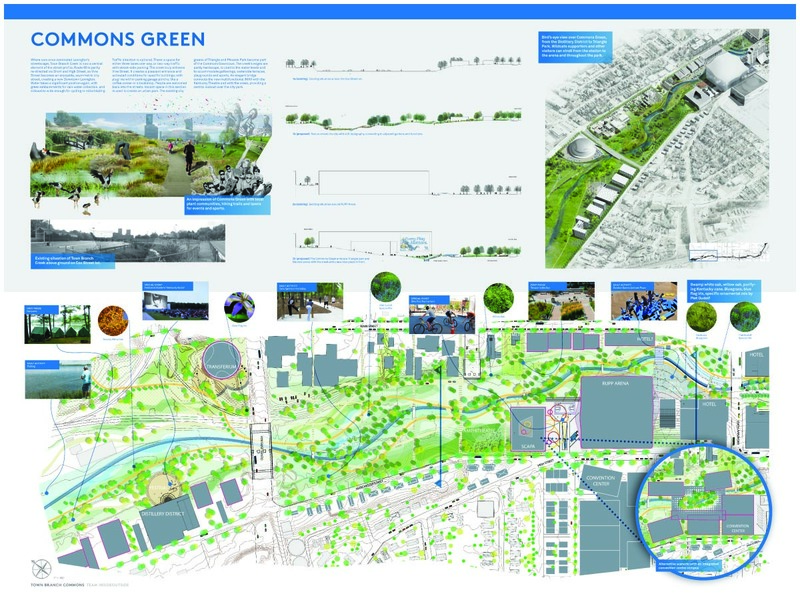 CIVITAS’ proposal envisioned opening up the creek as a thread to facilitate urban discovery. Surrounded by pavings during its progress along Vine Street, it is only briefly interrupted by “Bluegrass Hollow” at the intersection of Martin Luther King Boulevard. Also closed off to vehicular traffic, the most salient feature here is the Bluegrass Roof, functioning as a connector from the higher elevation southeast over Vine Street. The problem here might be that this elevated park structure is not part and parcel of the journey along the creek, but an isolated object. An additional problem area could be the change to the traffic pattern at Triangle Park, in front of the Convention Center. Although well-meaning, shutting off that lane of traffic flow could mean more congestion and longer waiting times. This is probably an unnecessary challenge to the traffic engineers. 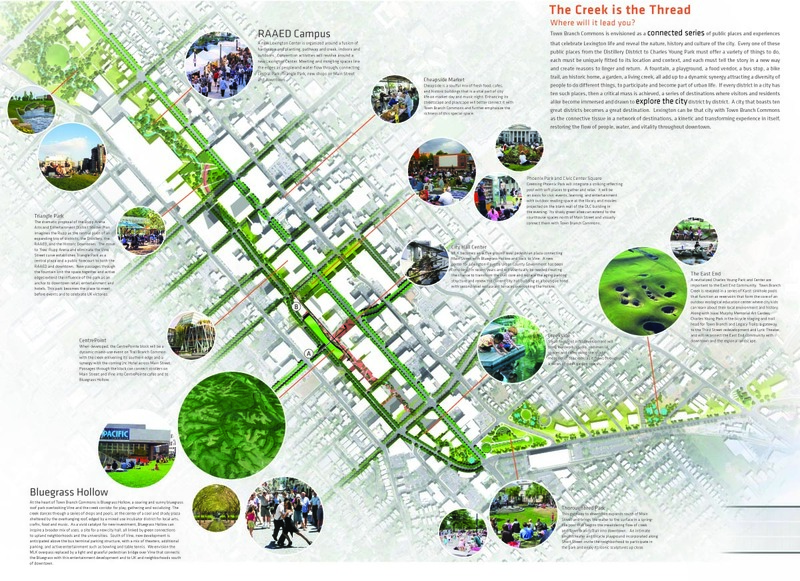 Coen+Partners’ proposal was based on the motto, “The contiguous and complex mosaic of Town Branch Commons was driven by metrics associated with five design overlays: cultural networks, energy dynamics, mobility scales, natural systems, and livable networks.” Of all the concepts, theirs would seem to be the most conventional, using tools such as infrastructure, modal transportation and the conversion of one-way streets to two-way streets as solutions to a wider downtown development scheme. 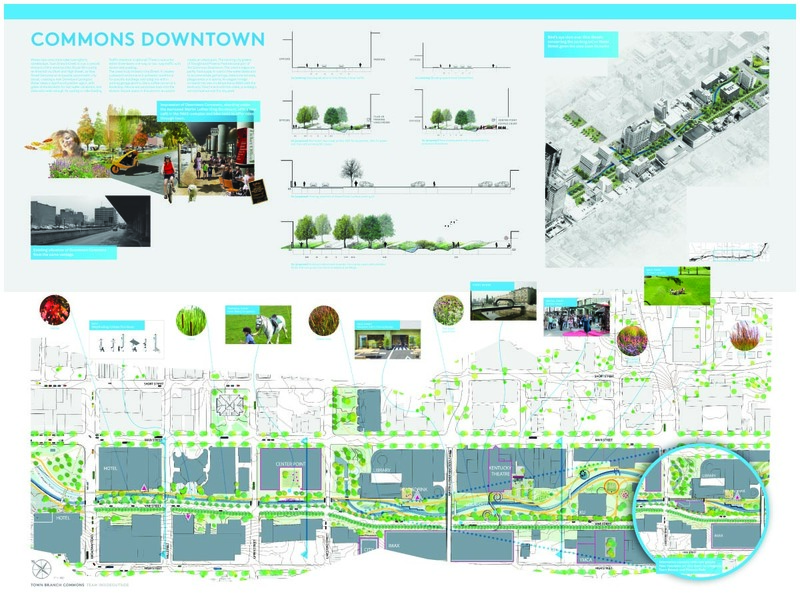 By adding housing and depending on the construction of commercial and government buildings, they essentially followed a frequent formula we find in many such proposals for downtown renewal projects. In this case, the creek seemed at times to be the bystander. 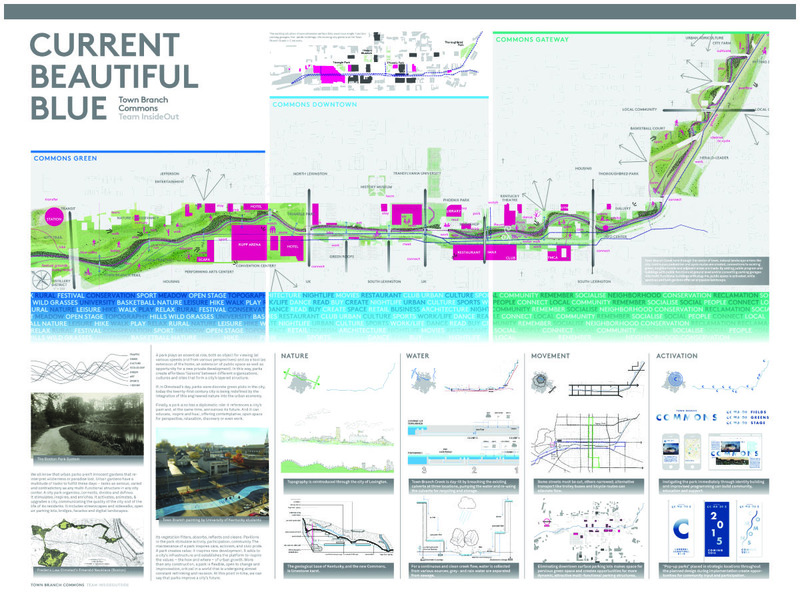 The proposal by Inside Outside of the Netherlands relied heavily on the greening of the site. 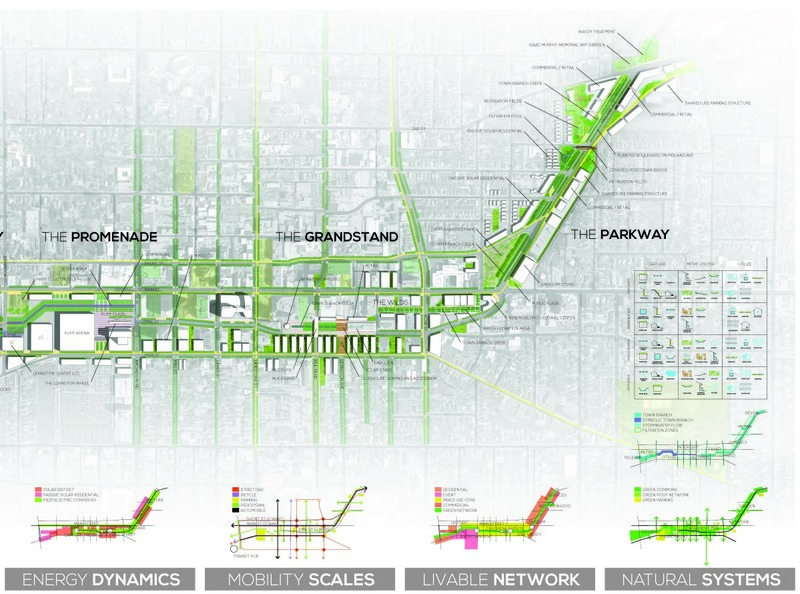 They specified five layers of green along the Town Branch Corridor. Small pavilions, fields and squares would be interspersed along the site to energize the park at intervals, “like sparkling beads in a necklace.” At the same time, they would try “moving people from cars to pedestrians and cyclists, from private vehicles to public transport.” Inexplicably, they would relocate the transit center from downtown to make room for cultural activities, eliminating a convenient location for downtown commuters. 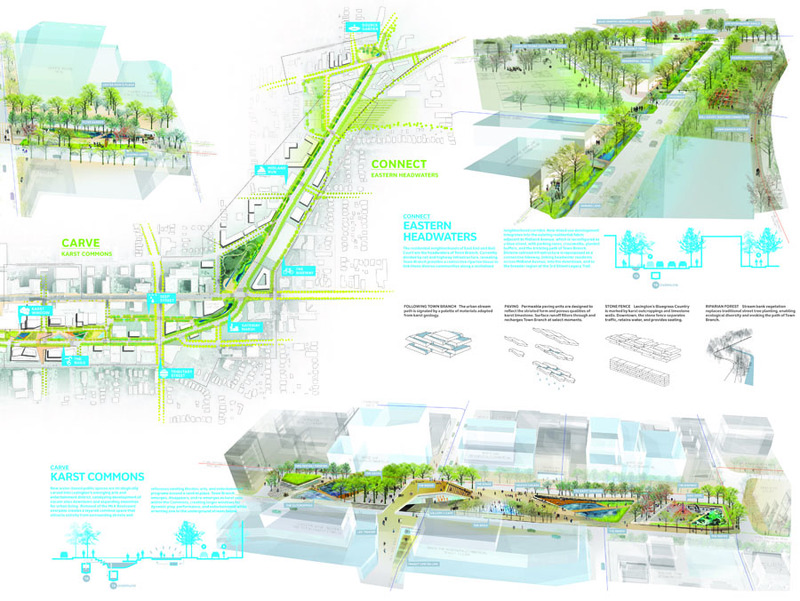 In essence, this is a very straightforward linear park idea, with maximum emphasis on vegetation. 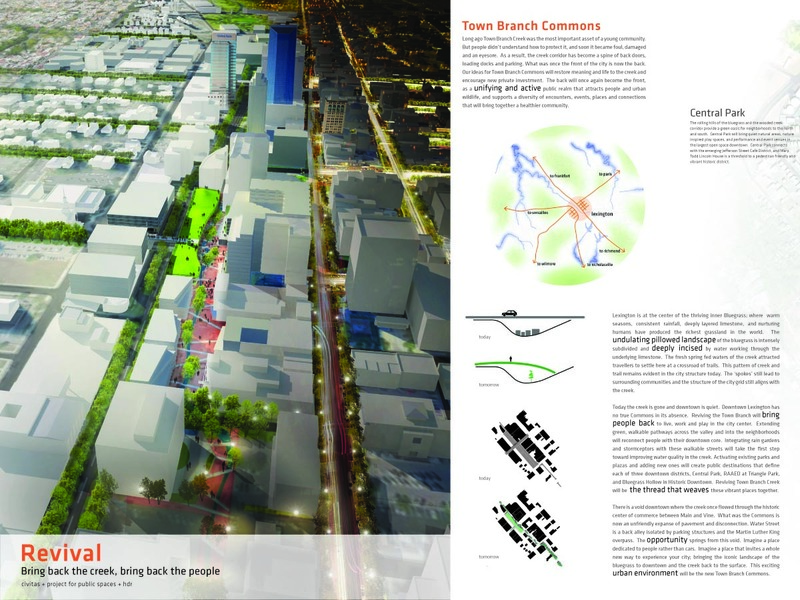 JDS + BALMORI ASSOCIATES concentrated their “center of gravity” around the portion of Vine Street defned by Rupp Arena on one side and Limestone Street on the other. 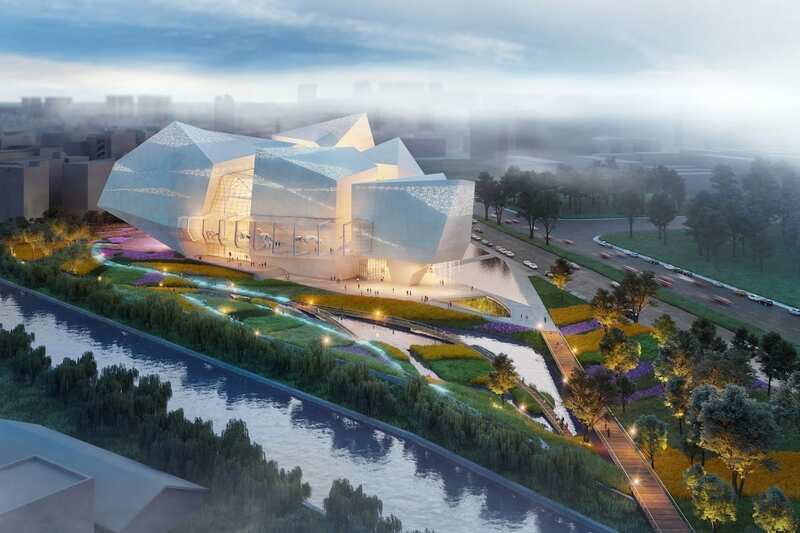 They see Rupp as the generator of activity and Limestone as a connector of the two local universities, dotted with commercial and cultural venues. They feel that intense development of this end of the site would have a radiating effect on the rest of the downtown, leading to more development: “By converting this key section of Downtown to public and smaller scale activities we will create a pocket of protected pedestrian life immediately adjacent to the surrounding buildings, transforming their relationship to the street into an active one.” To the east around the stretch of the bus station, they can even envision real-estate developments—in keeping with height limitations. 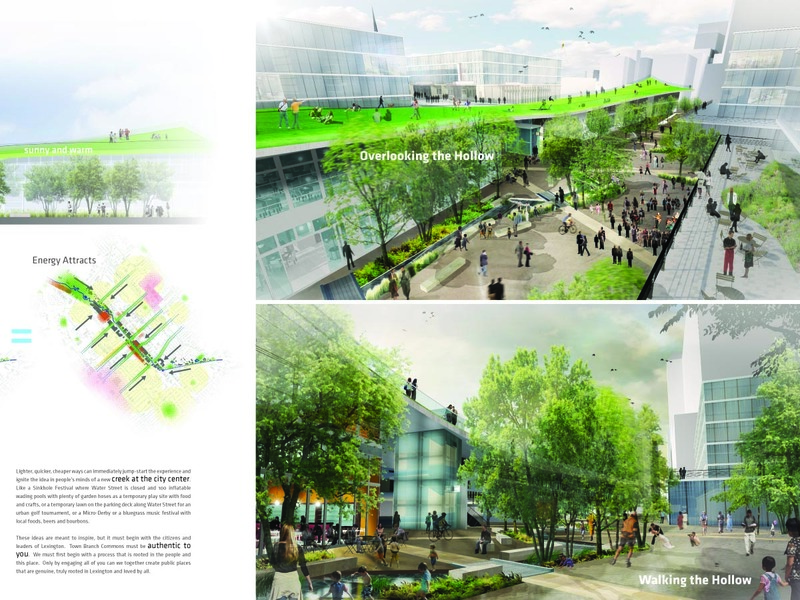 It is notable that the development of the Rupp Arena area, although on a much smaller scale, in many ways resembles Balmori’s Sejong City project in South Korea, where much of the infrastructure is under a gigantic green roof program.